Go back to King Arthur's Era in Excalibur's Choice Slot by Barcrest Games and make history! Travel back in time to the medieval age and set out on your own adventure in King Arthur's Kingdom. Barcrest, the software provider of this slot game chose to stick to a basic and simple game format, nevertheless offers a delightful experience to players. The Excalibur's Choice Slot comes in a 5x3 format with 10 fixed paylines and features a single bonus round where a single spin can help you win money that equals to a lucrative 5000 times your stake. Even though uncertainty surrounds the original Arthurian legend, this slot machine gives you a chance to live your very own legend and pull the magical sword out of the stone. Should you decide to spin the reels of this land based classic from the comforts of your home, try the demo version available right before staking your real money. Barring the scatter pays, all the wins in this slot game are paid on an active pay line starting from the left most reel to the right most reel. On an active pay line, all wins are adjacent to each other except for scatter pays. How to Play the Excalibur's Choice Slot? Settings – The settings button gives you access to the sound settings. You can choose to switch on or off the game sounds. Info (?) - Clicking on the information button toggles the game's functions. Apart from this, it also consists of information on the pay lines, pay table and the various symbols. The section also briefly explains all the special features of this online slot game. Spin Button – This button spins the reels into action at a predetermined bet level. Further, this button switches to the stop button while the reels are spinning. Autoplay – This button allows you to spin the reels of Excalibur's Choice Slot uninterruptedly for a fixed number of rounds at a preset bet level. Using the advanced settings, players can fix the number of rounds they wish to play, the winning limits as well as the maximum loss limits. Bet Level – Via this field, players can set the bet level, they wish to spin the reels at. Use the +/- button to adjust the bet and determine the one that fits your pocket the best. Players have an option to spin the reels starting from 0.10 to 500 bet credits. Visually simple looking slot game, Excalibur's Choice slot only has the bare minimum essentials displayed on the game's home screen including – the spin button, information button and bet levels. At each side of the slot screen are stone walls of the castle covered with leafy vines. Whereas, the sandstone reels display all the symbols which represent the medieval age or the Arthurian Era. Regardless the high quality graphics provide this slot game the required edge. Acoustically, the software provider decided to not use a dedicated soundtrack. The slot kingdom remains silent in between spins, however a happy tone plays after every win interspersed with normal reel spinning sounds. King Arthur takes the place of the most lucrative bonus symbol where landing 5 of these symbols can award you a win equal to 500 times your stake. Following closely is the Castle Symbol, together these two symbols make the High Paying Symbols for this slot game. There are 3 mediocre paying symbols and are denoted by a Knight on a Horseback, a Crown and a Royal Ring. These symbols have a beige background which enables the pictorial presentation to be more noticeable. Playing card suits starting from A and including K, Q, J and number 10 symbolize the low value symbols on the sandstone reels. All these are represented in medieval style format. The Excalibur Sword Symbol doubles as the Wild as well as the scatter symbol in this slot machine. It replaces all other symbols and when serving as the scatter it pays anywhere on the reels. During the free spins game, a standard reel symbol is selected randomly which substitutes as the Special Symbol. This symbol pays on any active paylines after it expands to cover other symbols. More information about this has been given in the review ahead. This feature is activated when 3 or more Excalibur Symbols land anywhere on the reels. Under this feature, players are awarded with 10 free spins plus coins wins that can go as high as 200 times your stake. During the free spins game, a random symbol from the reels is chosen and is termed as the Special Symbol. When the free spins are active, this special symbol expands and pays on all active pay lines thus manifolding your chances to win! Simply put, this special symbol pays out like a scatter but the special symbol pays are equivalent to the value of the particular symbol in the base game. The special symbols need not be adjacent to award winning pays and acts as an added advantage. The inception of Barcrest can be dated back all the way to 1968 but was acquired by SG Gaming, a division of Scientific Games Corporation in the year 2011. A trusted brand, Barcrest provides quality solutions to multiple casino operators online. Having developed numerous slot games that speak for themselves like Rainbow Riches, the slot machines by this software developer exhibit varied themes, features and designs. Employing the latest technologies, Barcrest enables a seamless cross platform integration. In addition, this software provider keeps updating its processes to provide enhanced game play for all the players. A world of stellar digital entertainment awaits you when ever you launch a game powered by Barcrest. How about getting started with Excalibur's Choice slot and experiencing amazing gaming for yourself? A perfect blend of a simple classic slot machine with the latest high quality graphics, the Excalibur's Choice Slot takes you on an entertaining medieval adventure which begins from as little as 0.10 credits per spin. Steer your way towards this Arthurian Slot game and try your luck where you can find out whether the sacred sword will grant you big wins. The RTP of this Barcrest Slot Machine varies in regard to the bet level. A bet below 2.00 credits will fetch you a return of 94% only, whereas the expected game return goes up to a generous 96% for bets above 2.00 credits. Playable on the go and in the desktop version, this slot machine is compatible with devices supported by iOS, Windows and the Android systems. All said and done, the simplest things indeed provide us the most happiness, so derive the joy and play Excalibur's Choice Slot for real money at any of the suggested online casinos given below. 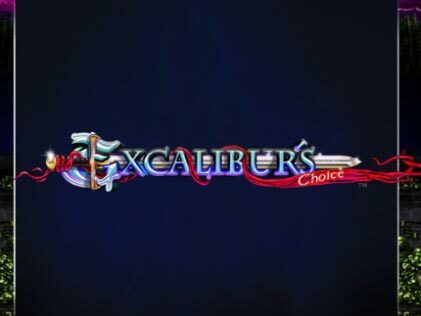 Please enter your review for the Excalibur's Choice Slot.